You will find that the male and female receptacles on Schmartboard jumpers are thinner than most on the market, which allow you to work better and easier in tight areas. Our Female receptacles fit snuggly on 0.1" and 2mm headers. We challenge you to compare ours head to head with others because we know you will immediately understand the difference. 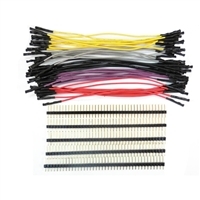 They are rated to handle the following specs: 28AWG, UL1007, 80 deg C, 300V.